Ordinary number signature Wiwatchai UNC about 2,000 - 2,100 baht. 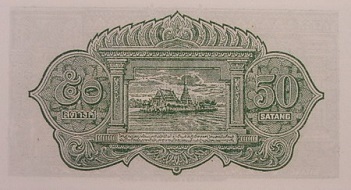 This banknote was printed at the suggestion of Khun Samaharnhitakhadi, minister of finance, after his official trip to Japan and China. The minister of finance placed orders with Thomas de la Rue in 1941, shortly before the outbreak of the WW2. 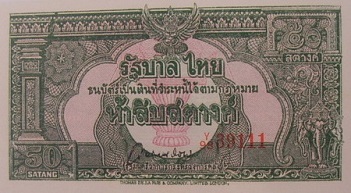 The banknotes had been printed but were stored at the company because of the war and delivered to Thailand after the end of the war. This 50 Satang banknote was announced on January 26th, 1948. The main object is the constitution placed on a pedestal tray surrounded by a guilloche design. The upper center is the Garuda. The 3 headed elephant ai at the lower right corner. The main object is the Phra Samut Jedi at Samutprakarn.